Lee el relato anterior en « What to do in Edinburgh… for FREE! 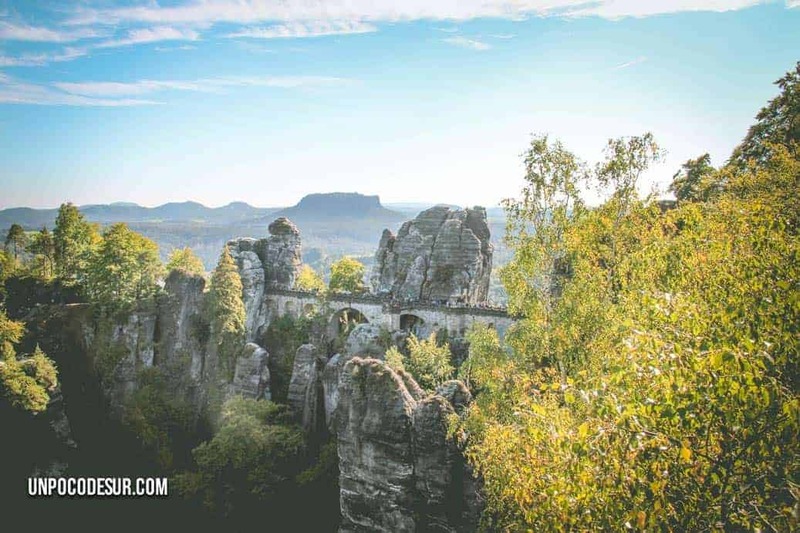 Only 30 km way from Dresden and about 230km from Berlin we can enjoy the Saxon Switzerland, the last territory before the border with the Czech Republic is full of beautiful landscapes out of this world. There are beautiful tiny villages along the whole riverside (both sides) creating a lovely valley that serves as the front door of the Elbe mountains National park. Some of you might know the Basteibrücke from your Windows 7 screen background, some other, like me, probably don’t even know about its existence, in any case, from the first time you see an image from this incredible place you want to know where is it and how to get there. The bridge is 194 meters high and has been a touristic call from already 200 years. Everything started in 1824, a wooden bridge was built to connect some of the stones and make them accessible to the visitors. After the success of the bridge this one was upgraded for the one you see in the picture in 1851. When we found out it’s so close to Berlin we decided to give it a shot, our surprise came after the trip, when we realised our “main” goal was actually the “least impressive one” honestly the whole area it’s absolutely stunning. The complex counts with various hiking paths from 3 to 25 km, the shortest one is the massive visited that gives the round to the bridge, around 3km. During the way up there are many panoramic view points you shouldn’t miss. As a personal recommendation, after the bridge keep on the hiking path that goes through the Schwedenlöcher “Sweden holes”, way less people take the long way and it’s amazing. Really. Take a train or bus to Dresden. The cheapest option in the bus, from 7 € you can find tickets, the bus leaves every hour in the morning and takes about 2,5 hours. Your stop is Dresden central station. From the same station take the S1 (track 18) direction Bad Schandau or Schöna and leave the train in Rathen, there is a train every 30 min. The ticket costs 6€ per person, keep it, you can use it to cross the river on the little ferry afterwards, the real Rathen and the starting point of the Bastei path is on the other side. There is a tiny grocery shop with basic stuff but it closes at midday for lunch. There is no ATM and if you know germans they are not the biggest fans of debit or credit cards so bring enough cash for the rest of your trip. Tourists are mainly from Germany and Czech Republic, english is a little bit harder to find than in bigger places. If you have more days to enjoy the area, and I recommend you so, keep on going south direction and get in to the Saxon Switzerland National Park, read about our hike here.